2016 Malik Henry visited Michigan’s campus this past Sunday. Henry who is rated as the #1 Pro-Style QB in 2016 according to 24/7 made a surprise visit last week to the SMSB camp in Detroit then, made the drive to Ann Arbor to check out the campus. For more on Malik, click here. Malik Henry wasn’t the only California prospect to check out Ann Arbor this week. KJ Costello headed to Ann Arbor also after attending the SMSB camp. Sometimes pulling a prospect out of California can be difficult due to the weather. Well, KJ seems to think otherwise. Costello is ranked as the #5 Pro-Style QB in 2016. After visiting Ann Arbor, Costello headed to South Bend on Monday to check out Notre Dame and will visited Alabama on Tuesday. For more on KJ Costello, click here. 2015 TE Chris Clark will announce his decision at The Opening in Oregon on July 10th I really like Michigan’s chances here. Chris has had great visits to the campus in the past and, has been on record as saying he would like to catch balls from current Michigan commit Alex Malzone while in College. Both Chris and Alex will be heading to Ann Arbor on Thursday for a visit. Michigan apparently is no longer recruiting Jashon Cornell according to Sam Webb. The coaching staff believes his skill set will be better suited on the interior of the defensive line rather than the outside. Cornell has bulked up drastically over the past year and, and the coaching staff may have decided that he would be better off as a defensive tackle. Michigan hasn't been recruiting a DT for 2015 and, will likely use their time spent on Cornell to attract KLS or Roseboro to come to Michigan as they desperately need a pass-rusher in the 2015 class. 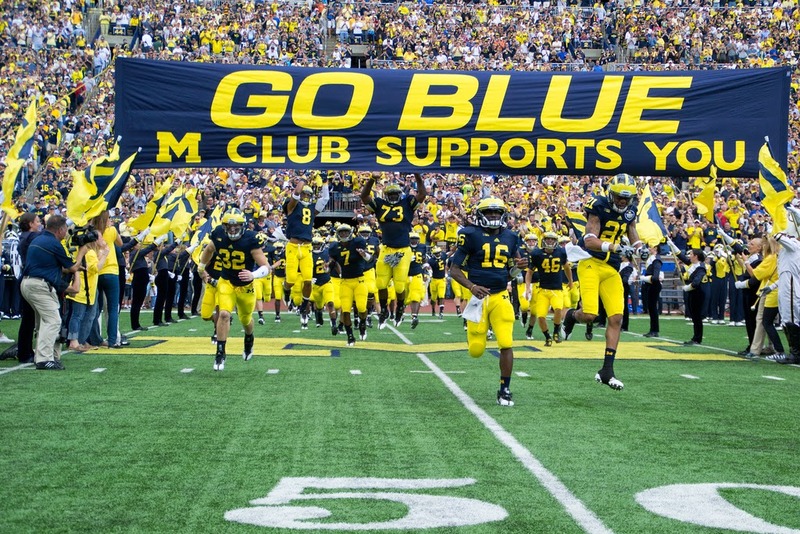 2016 ATH Tyrece Speaight will visit Michigan on Wednesday. Speaight has not yet been offered a scholarship by any schools. However, he does hold a 24/7 crystal ball reading of 89% Ohio State and 11% Michigan. If Tyrece impresses the coaching staff while on a visit, look for an offer to be extended his way. · 2016 WR Austin Mack. · 2015 DB Mook Reynolds. The coaching staff has had a great start to the 2016 recruiting cycle. They've had lot's of positive feedback from recruits such as Costello, Henry, Crawford, Upshur and others. Although there is only 1 commit so far in OT Erik Swenson, Michigan has put themselves in good position to land quality prospects going forward. 2016 could turn out to be one of the best recruiting cycles in Hoke's tenure if all goes according to plan. 2015 LB Tyriq Thompson visited Michigan on Tuesday. It’s been long thought that Tyriq’s recruitment would come down to an instate battle between MSU and Michigan. On Sunday Shaun Crawford officially committed to Notre Dame. Shaun decommitted from Michigan last month, and was long thought to be a Notre Dame lean since his decommitment. 2015 LB Justin Hilliard will visit Notre Dame and Ohio State this weekend. This is the last of his 2 scheduled visits before he announces his college decision. Hilliard was on Iowa’s campus last weekend were his brother is a current Hawkeye. Hilliard will announce his decision later this month. 2016 WR Steve Smothers named West Virginia his leader Tuesday over twitter. Steve also announced that Alabama was his second choice. Michigan offered Steve last month. He’s currently rated as the #9 Wide Receiver in the class of 2016. 2016 QB Jarrett Guarantano will be visiting Michigan on Thursday and, will throw in front of the coaching staff. Jarrett is currently listed as the #3 Pro-Style QB in 2016 according to 24/7. 2016 RB Elijah Holyfield son of famous boxer Evander Holyfield will be camping at Michigan today. I expect Holyfield to land an offer sooner rather than later.